This entry was posted in Announcements, Extras & Millinery News and tagged Froilan de Marichalar, Infanta Elena, Mike Tindall, Peter Phillips, Princess Anne, Queen Elizabeth. Bookmark the permalink. It’s just no fair for HM to wear a new hat when we can’t get a good look at it! The lovely flowers on the Millinery Jill headpiece prove your point about how well leather holds details, HQ. I like the RTM hat as an alternative to red for royal visits to Canada. This would also be a fun choice for Sophie Gregoire. I just have to say I think Henrik is being extremely petty about all of this and this really shows just how insecure he is. It’s really unfortunate, but I honestly have no sympathy for him at this point. Moving on, it’s really surprising to see HM bust out a new hat on such a low-key outing, but it’s not the first time she has done so (remember the purple and white from early last fall? ); I also think it demonstrates how important the church and her faith is to her, that she’s willing to show off a new hat in church on a regular Sunday rather than give precedence to the world for such things. Prince Henrik’s announcement: like others, I am baffled as to why anyone at this level of public life would decide to issue a statement so damaging to their personal reputation. The Prince is of an age where his health, mental and physical, may not be what they were. I hope that he is receiving every possible support. You raise an interesting point about Prince Henrik’s health, although of course I wouldn’t speculate. But honestly, what an announcement! Thank you for acknowledging Henrik’s unusual decision. It quite stunned me. Other ‘prince consorts’ settled into their roles after initial upsets – Albert, Phillip – so it seems extraordinary he’s still complaining, and in the process is being rather mean to his lovely wife (but perhaps neither of them care particularly if their mortal remains are side by side, she seems pretty pragmatic). He’s been a great hat wearer over his public life with his choices sometimes unpredictable and eccentric – and we love him for that – but this is the other side to that coin. Do you mean Claus instead of Albert? King Albert was heir (following his brother) in Belgium, not consort. Prince Claus was consort to Queen Beatrix in the Netherlands. (smacks forehead) Of course! The Alberts running through my head were all contemporary ones! I loved that series, despite the historical inaccuracies. Montgomery Millinery’s white hat is absolutely gorgeous! Even though it hasn’t graced the head of a Royal, it’s my favorite hat of the year. Just stunning! I felt the same way when I saw it! 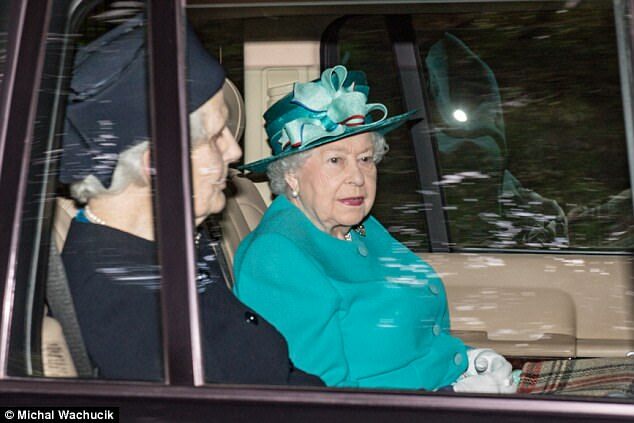 It’s tough to tell, but I wonder if that coat on HM is an existing one with a new hat? It does look like the turquoise coat she is so fond of, but the light could be playing tricks! I see what you mean, JamesB. My first thought is that the outfit last Sunday was a darker shade of teal but it’s so hard to tell conclusively with photos taken in completely different light.